LK 160 SmartBio® is an electronic differential temperature controller with several preset hydraulic systems for energy efficiency in heating systems with storage tanks. The chosen hydraulic system and operation status is shown on the backlit colour display. Controls and settings are easily carried out using the rotating knob and the esc-button. 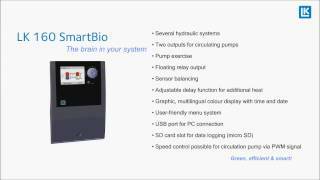 LK 160 SmartBio® can handle high efficiency pumps. LK 160 SmartBio® can also activate an immersion heater or burner if the temperature in the primary tank falls below the selected value. The additional heat has a sophisticated delay function that further adds to the efficiency of the system. Hydralic system 1 is intended for storage tank systems with a primary and secondary tank. LK 160 SmartBio® controls the two circulating pumps between the tanks. When the primary tank is fully charged the charge pump starts at the chosen temperature to fill the secondary tank. When the temperature in the primary tank falls, the recharging pump starts and transfers energy back to the primary tank. check valve should be mounted between the circulating pumps - see under spare parts and accessories. from the main tank to the secondary tank. By measuring the temperature difference between the tanks LK 160 SmartBio® controls the charge pump. Hydraulic system 3 is intended for the charging of a storage tank with a pellet, oil or gas fired burner. By measuring the temperatures in the tank and boiler LK 160 SmartBio® controls the burner and charge pump. a fast transfer of heat to the domestic hot water tank. LK 160 SmartBio® controls the charge pump to the domestic hot water tank, the zone valve of the main tank and the circulator in the heating loop. Hydraulic System 1.1: In order to prevent self-circulation in both directions LK 970 ThermoBac DB double acting check valve should be mounted between the circulating pumps - see under spare parts and accessories. Hydraulic system 2 is intended for storage tank ­systems in which heating water and domestic hot ­water are taken from a secondary tank. Heat is to be ­transferred from the main tank to the secondary tank. By measuring the ­temperature difference between the tanks LK 160 SmartBio® controls the charge pump. Hydraulic system 4 is intended for storage tank systems with domestic hot water tanks. This system gives priority to the heat in the upper part of the main tank. This enables a fast transfer of heat to the domestic hot water tank. LK 160 SmartBio® controls the charge pump to the domestic hot water tank, the zone valve of the main tank and the circulator in the heating loop.